The Bronx Museum of the Arts will hold its annual benefit and auction on Monday, March 5, 2018 at 6:30pm at the Conrad New York in lower Manhattan. All proceeds enable the Museum to continue offering free public programs, Free Admission, internationally recognized exhibitions, and arts education programs to over 16,000 Bronx youth each year. 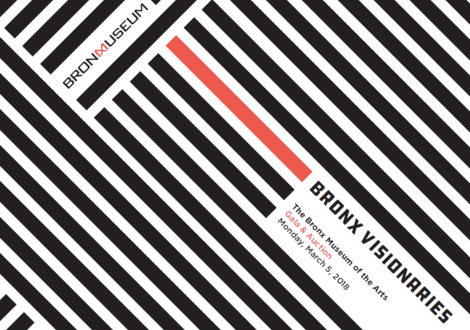 For more information, contact gala@bronxmuseum.org or 718-681-6000 x 174. HOLLY BLOCK, with deep ties to the Bronx, the late and much beloved Director of the Bronx Museum, was a visionary and pioneer whose international reputation as a director, curator, and champion of artists was boundless. EDWARD "Eddie" PALMIERI, raised in the Bronx, is a NEA Jazz Master, Grammy Award-winning Pianist, Bandleader, Composer and Arranger of Salsa and Latin Jazz music. MICHELE ROBERTS, born in the Bronx and a former Public Defender for the District of Columbia, Roberts is the first woman to head the National Basketball Players Association. JOE ZICHERMAN, “local boy makes good,” grew up six blocks from the Bronx Museum and attended the public school system including DeWitt Clinton High School to become a top money manager at Morgan Stanley, founder of Stadium Capital Partners, and Bronx Museum trustee. Gerald Weinstein, General Hardware Manufacturing Co.